Edward Lee may be a multi-year James Beard Award nominee and “Top Chef” participant, but the subjects of his new book, “Buttermilk Graffiti: A Chef’s Journey to Discover America’s New Melting-Pot Cuisine,” aren’t high-flying culinary celebrities; they’re the restaurant owners and family chefs that he met while eating his way across the country. What interests the chef of 610 Magnolia, Milkwood, and Whiskey Dry in Louisville, Ky., is the origin story of a meal, the person who prepared it, and the fascinating and ever-changing picture of American cuisine. “To me, when you eat something delicious, that’s the beginning,” Lee explained to the Los Angeles Times. “Whenever I eat something that’s truly transformative, I want to unravel it all, and it starts with the person cooking.” That included, in Clarksdale, Mississippi, Lebanese sisters who make cabbage rolls, and, in Montgomery, Alabama, a Sabo Suya Spot where people line up early to eat food made by a former Nigerian prince who moved to Texas in 1997 to work as an agricultural engineer. Does everything have to be assimilated to be American? This is the question Lee asks after his trip to Dearborn, Mich., a small, industrial town home to the first Ford Motor plant and the largest Arab-American population in the United States. Following a humbling conversation in a Middle Eastern bakery, Lee decides that the most authentic way to experience the region’s cuisine during Ramadan was by fasting. Lee’s focus on the often anonymous people behind the food we eat speaks to his concern with meaning and substance. “Maybe the lady in the home kitchen isn’t doing something with a vacuum sealer,” he says of the untrained cooks he met traveling across the country, “but I can tell you the food I ate on these trips was as good as anything I’ve eaten in any restaurant.” Their tact, resourcefulness, and ingenuity moved him. “I can’t tell you how many times I actually cried, or was on the verge of crying, listening to these people and their stories and their devotion to food,” he said. In New Orleans, LA., for example, Lee learns that the history of the beignet varies depending on whom you ask, and that it’s impossible to separate it from its once more famous cousin, the calas, which can be traced back to Africa. In Mississippi, Lee discovers a Lebanese kibbeh made with beef, not lamb, because beef is a local favorite and it’s cheaper. And in Westport, Conn., he is taught how to prepare Moroccan smen from a recent immigrant from Marrakesh. “Buttermilk Graffiti” does not provide an answer to that question, but it does give us some perspective. And a little perspective can go a long way. 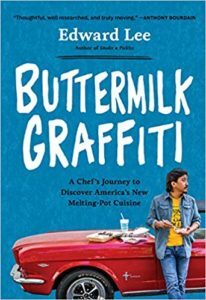 “Buttermilk Graffiti: A Chef’s Journey to Discover America’s New Melting-Pot Cuisine” was named a Best Food Book of the Year by the Boston Globe, Smithsonian, BookRiot, and more. Edward Lee is the author of “Smoke & Pickles;” the chef/owner of 610 Magnolia, MilkWood, and Whiskey Dry in Louisville, Ky.; and culinary director of Succotash in Washington, D.C., and National Harbor, Maryland. 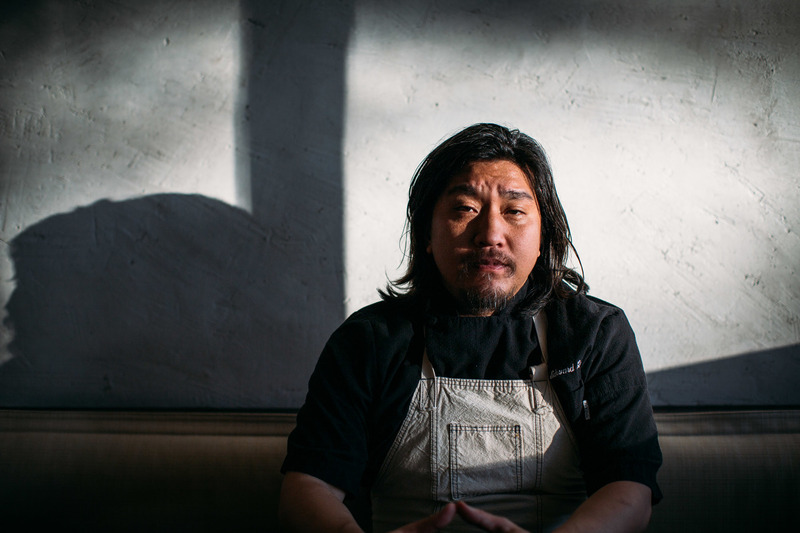 Find him on Instagram and Twitter @chefedwardlee.